Senator Elizabeth Warren has followed a circuitous path to the largest stages of American politics. Raised in Oklahoma by a family of modest means, she won a college scholarship but dropped out to get married at 19. Later she got her degree, then a law degree, and ultimately became a Harvard Law School professor and a leading authority on the economic struggles of American families. Along the way, she came up with the idea that eventually became the Consumer Financial Protection Bureau, created as part of a new regulatory bill enacted after the 2008 Wall Street crisis. Republican senators announced they would block President Barack Obama from placing her atop the bureau, so in 2012 she won a Massachusetts U.S. Senate seat for herself. 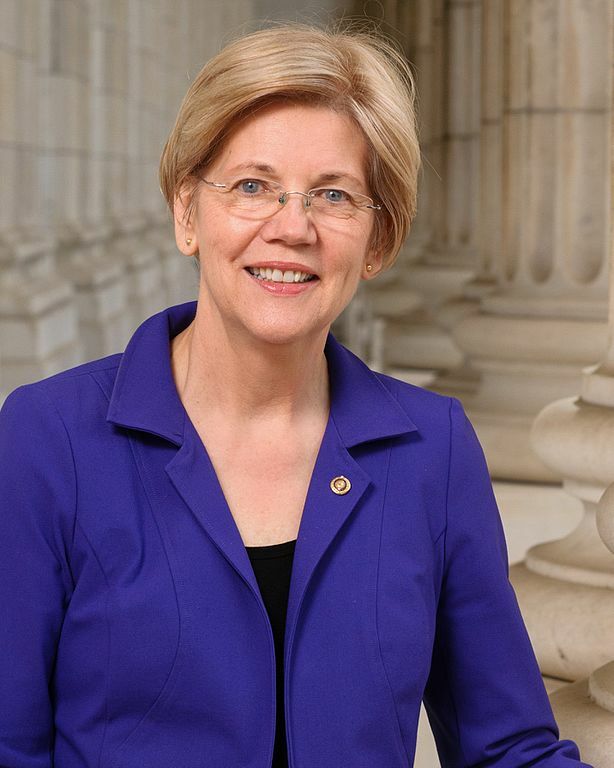 Heavily favored to win a second term this fall, Warren has moved to the front ranks of Democratic presidential prospects to take on President Donald Trump in 2020. The 69-year-old Warren sat down with CNBC editor at large John Harwood at a cafe in Pittsfield, Massachusetts, to talk about Trump, the American economy and the political path forward for the Democratic Party. A partial transcript from Speakeasy with John Harwood featuring Senator Elizabeth Warren follows. John Harwood: Let me start with a question about the predicament the country's in right now. There's some people who look at what happened in Helsinki, what happened with NATO and the G-7, the Mueller investigation and say, "well, we have a President who's very unusual, eccentric, but the government's kind of running on a separate track from the President." There are other people who are more alarmed, who think that we're actually in a national security emergency at the moment where the behavior of the President is urgently problematic. What do you think? Senator Elizabeth Warren: So I see this as the behavior of the President is deeply problematic. And the reason for that is, he puts us in a very different place internationally. He attacks our allies and cuddles up to dictators. And by attacking our allies he not only distances us from them, he also is basically teaching our allies they can get along without us. Does the dollar have to be the reserve currency? You know, that's of enormous value to America. But if you've got an unstable leader, everybody else starts to back up and say, "Wait a minute, I want to rethink that." Harwood: But do you have any belief or concern that it's more than instability? That some people – John Brennan, among others – have suggested that Vladimir Putin has something on him, and that makes him a Russian asset. Warren: Look, I don't know. All I can do is measure what he does. And when he stands up and attacks our intelligence agencies and attacks our law enforcement officers, and then defends a country that has launched a cyberattack on the United States — and indeed, seems to go, "wink-wink, nod-nod" — then boy, he is not serving the interests of the United States of America. Harwood: The fact that I’m asking you that question is an indication of how people's nerves have gotten jangled by the moment that we are in. When you think about what you and fellow Democrats need to do in response, do you see more of an imperative to calm, soothe, or fight? Harwood: You are more polarizing than some. And my question to you is, do you embrace that? Are you happy with that? What do you think? Warren: You know, that's funny you'd say that. I actually don’t see it that way. I see it as wherever I go, people know what I fight for. And a lot of folks agree with me, and even a lot of folks who don't, respect the fact that I’m pretty darn clear about it and pretty straightforward about my fights for it. Harwood: But you recognize that, say, with businesspeople, with Wall Street, you're a very polarizing figure? Warren: Look, I get that there are a lot of folks who like having the power and the riches they have. They like being able to tweak their little pinky and the United States government does just what they want. They like being able to get regulations rolled back or not enforced. I totally get that. And I get that I push hard against that, that I may be a threat to them on that. But my view on that is, don't call me the polarizing figure; they're the ones who want to take advantage of this country. They're the ones who want to cheat. They're the ones who want to say that their personal wealth, their power is more important than building an America that works for everyone. Harwood: You don't think capitalists are bad people? Warren: I am a capitalist. Come on. I believe in markets. What I don't believe in is theft, what I don't believe in is cheating. That's where the difference is. I love what markets can do, I love what functioning economies can do. They are what make us rich, they are what create opportunity. But only fair markets, markets with rules. Markets without rules is about the rich take it all, it's about the powerful get all of it. Harwood: Are you concerned about the high deficit or are you willing – as you think about what Democrats might want to do – Medicare for all, for example, very expensive. Warren: Of course I worry about the deficit. But I also worry about how we build a future. And right now, we're choking off the future for young people. We're choking off the future for hardworking families who are watching the cost of their health insurance go up. Harwood: And that’s a bigger problem right now than the deficit. Warren: That is a big problem right now. Harwood: You've talked about how you grew up on the jagged edge of the middle class. Donald Trump appealed to people on the jagged edge of the middle class. How do you think he's doing for them? And if you think he is not doing well as I suspect, what would you do for rusted-out factory towns, coal towns? Warren: Well, let’s start with Donald Trump. He made big promises to a lot of people who've just gotten the short end of the stick over and over and over. And he not only hasn't delivered on those promises, he's literally turned in exactly the opposite direction. For me, what this would all be about is investing in all of America. And the best place for me to start is infrastructure. You know, infrastructure is like plowing your fields. If you plow your fields, you can grow things in the future. If you don’t plow your fields, you can’t. Harwood: We also have tremendous racial polarization in our politics that has made it difficult for Democrats to attract votes from some of those people. I remember a conversation I had with President Obama a few years ago and said, “Are you concerned about this racial polarization?” He said, “No, when those working class white voters recognize what Obamacare is going to do for them, they will come around.” That has not happened. Warren: So, look. What I think is going on here is that Donald Trump identifies a real problem in America, and that is a lot of folks are hurting. And then he takes a turn and says, "and it's the fault of those people.” People who don't look like you, people who don't sound like you, people who don't worship like you, people who are not the same color, who didn't speak the same language. Fill in the blank. It is their fault. What he wants to do is set working people against working people, black working people against white working people. Harwood: How can you make that case better than Hillary Clinton, or Barack Obama, or John Kerry? Warren: I can't look backwards at how anybody tried to make the case. All I can say is, I live this. I know this in my heart. This is what is etched on my heart. We can build a government that works for us. A government that works for people who get out every day and try to build something for themselves and for their families. And if, if, government is on their side instead of on the side of the billionaires, instead of on the side of the giant corporations, this country knows no limits. It is an optimistic story of what we can do together, but we've got to have government on our side. Harwood: President Obama's coalition, very heavy on young people, very heavy on nonwhites. Hillary Clinton was not able to motivate those people with the same success in 2016. There are some people who are making the argument that to really energize that coalition, to succeed as a party, Democrats need to go down a generation and have someone younger — one of the 40 or 50-somethings who are looking at running for president. What do you think about that argument? Harwood: Could you do it? Warren: Look I’m in the fight right now. Right now we better stay focused on 2018. Harwood: In the spirit of left-right unity, do you like what the President's doing on China tariffs? You agreed with him on getting out of the Trans-Pacific partnership. Harwood: And he is now talking very aggressively about not just the tariffs he's already announced, but potentially up to $500 billion in tariffs. You like that? Warren: So here's how I see this: I have been a longtime critic of our trade policy — I mean, a long time — because our trade policy has been negotiated by a handful of executives from giant corporations, and it's been negotiated to help them and leave everybody else behind. And I think that's a real mistake. I think tariffs are one of the tools in the toolbox, but they're only one of the tools. And so when we change trade policy in America, we have to have a plan. We’ve got to work with allies and we've got to make it work for the American worker. Trade policy for decades now has been tilted fabulous for multinational corporations that are trying to boost profits, and a real killer for American workers and American small businesses. Harwood: Do you think that the net effect of the president's willingness to challenge NAFTA, to challenge the EU, to challenge China — will the net effect of that maybe get to a place closer to what you like? Not only on tarrifs, but things like ISDS? Warren: It's like saying, "will chaos yield an outcome that you like?" That's the problem. Harwood: It’s good, but you don't want to bet on that? Warren: Well, I'd like to have a President that actually has a plan in mind and a way to execute on that plan that makes some sense. That's how I think we are stronger as a country. Harwood: The European Union just fined Google $5 billion. You like that? Harwood: The president criticized it and said, "That shows that Europe is going after American companies." Warren: No. What it shows is that Europe is serious about antitrust laws, Europe is serious about anti-competition laws, and the United States is lagging. We were once the leaders in the world on this, and no more. Warren: It's not about the number. Here's how I look at budgets — and taxes are at the heart of this. A lot of people think they're just numbers; they're not. They are the expression of our values. The values of the Republican Party that passed those tax cuts are to give $1.5 trillion away to the richest Americans and the biggest corporations, and let everybody else pick up the crumbs. And I don’t think that’s the right way to think about it. Harwood: What's too high for the top personal rate? Warren: It's not about a number. That's what negotiations are all about. Harwood: Is 50 percent obviously too high? Warren: Look, there was a time in a very prosperous America — an America that was growing a middle class, an America in which working families were doing better generation after generation after generation — where the top marginal rate was well above 50 percent. Harwood: It was 90 percent. Harwood: It doesn't strike you as obviously, "no, 90 percent, that's ridiculous. Can't be that"? Warren: No, look. Ninety percent, yes; 90 percent sounds pretty shockingly high. But what I’m trying to get at is this is not about negotiating over specific numbers. Harwood: After the 2018 elections, if Democrats have one or both houses, should the imperative for Democrats at that point be, from your perspective, to block things that the President's doing that you don't like, or to try to impeach him and get him out of office? Warren: Oh look, I take the impeachment question very seriously. But what that means to me right now is that special prosecutor Mueller needs to be able to finish his investigation and present all of his results to the American people. Harwood: But you don't see anything right now that suggests to you that he should be impeached? Warren: That's not the question. We have an ongoing criminal investigation. It has already resulted in more than two dozen indictments or guilty pleas. We need to get the investigation finished. Mueller needs to be able to do this with no interference — Republicans, Democrats, nobody. Let him finish his investigation, present it to the American people, and then we'll see what we've got.